The deep swimming area fronting the park is a former boat channel that was dredged through the coral reef in the late 1920s to join Kewalo Basin with the Ala Wai Boat Harbor. In 1955 Hawaiian Dredging Company closed the west end of the channel with a landfill, now Kewalo Basin Park, and in 1964 closed the east end with another landfill, Magic Island. Originally dredged for boat traffic, the channel is 20 to 30 feet deep and 1,000 yards long. Protected by a shallow reef offshore, it is one of the most popular open ocean swimming sites in Hawai’i. Magic Island, the man-made peninsula at the east end of the park, was completed in 1964 through the reclamation of thirty acres of shallow reef. Named Magic Island by its developers, the peninsula was the first phase of a resort hotel complex that called for two more islands to be constructed on the reef off Ala Moana Beach Park. The project stopped after the development of Magic Island, leaving the State with a man-made peninsula, which they converted into a public park. In 1972 the State officially renamed Magic Island ‘Aina Moana, or “land [from the] sea,” to recognize that the park is made from dredged coral fill. The peninsula was turned over the city in a land exchange and is formally known as the ‘Aina Moana Section of Ala Moana Beach Park, but local residents still call it Magic Island. 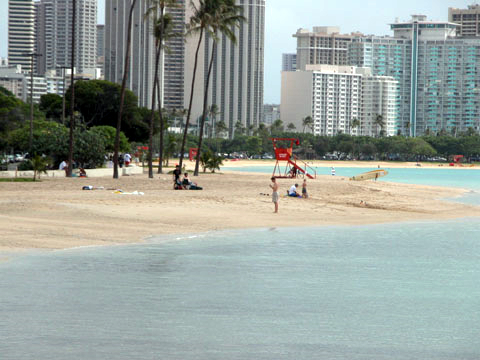 Today, as one of the most popular parks in Honolulu, Ala Moana Beach Park’s 76-acres fill daily with lawn bowlers, tennis players, joggers, picnickers, fishers, model airplane flyers, model boat sailors, sunbathers, surfers, and swimmers. The long sand beach in the park is especially attractive to families with young children who normally congregate at the east end of the beach where parking is plentiful and the ocean bottom is shallow and rock-free. Some of the south shore’s most famous surfing sites are found offshore at the edge of the reef, including Big Rights, Concessions, Courts, Big Lefts, and Baby Hale’iwa. Magic Island with its own sand beach and lagoon is also popular with swimmers and sunbathers. Surfers ride a spot called Bomboras off the west end of Magic Island’s seawall, and on calm days, scuba divers frequent the reef off the east end.